I’m Stew Friedman and I’m glad you’re here. Let me describe how this program came to life. By the mid-1980s, my professional life was humming. I had finished my doctoral work in organizational psychology, begun research on leadership development, and landed my dream job at The Wharton School. In 1987, on a beautiful autumn morning, our first child, Gabriel, arrived. I stood transfixed, holding this practically perfect being for the first time, and I wondered: What must I now do to make our world a safe and nurturing one for him? That moment changed my career. By giving voice to my feelings about what was important in my own life, and connecting them to the interests of others, I began a new journey. I saw how my professional role was enhanced by who I was in other aspects of my life, and I refocused my research to reflect the importance of bringing the whole person to work. 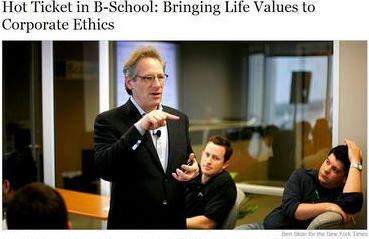 At the time, as the first director of the Wharton Leadership Program, I was trying to create a new model of business education for Wharton, one that encouraged students to question their assumptions about career success. We explored the intersection of career and life interests, using data we were generating through the Wharton Work/Life Integration Project, an initiative that gathered information from thousands of students and alumni. 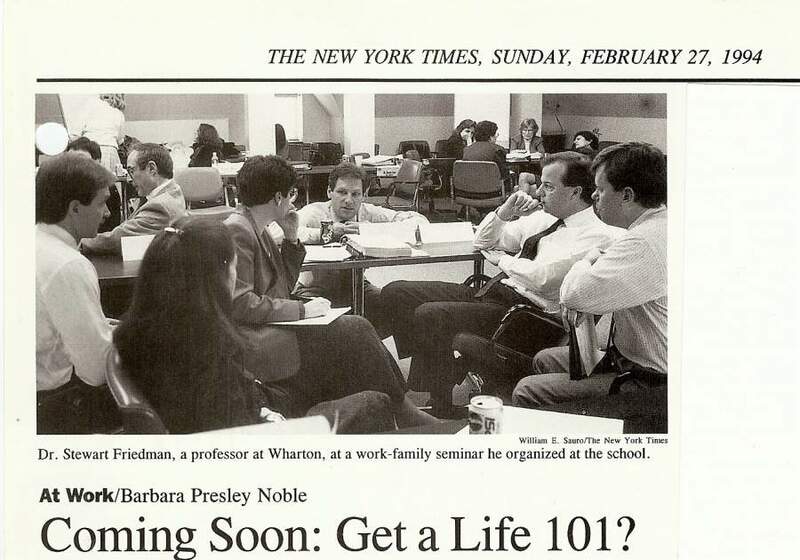 In 1999, I left academia to test my ideas in a corporate setting. The new CEO at Ford Motor Company wanted to connect leadership development with the need to help employees find better ways of integrating work with the rest of life. Our programs were dedicated to learning leadership by doing it, and we had to ensure that each of our participants produced value for the company while growing as leaders. We wanted them to think creatively about enhancing the company’s value to consumers, but we also wanted participants to see themselves in a new light; as reinvented, more confident leaders. Total Leadership became my shorthand for a new way to think about leadership, from the point of view of the whole person. We created something new: a program that starts and ends with the person – not the business person, but the whole person. Since returning to Wharton in 2001, I’ve refined this program while offering it in a variety of settings around the world. The point of Total Leadership is to create what I now call “four-way wins”– better results at work, at home, in the community, and for your self. Total Leadership has been a turning point in my life. Small experiments can alter your life in a great way. I have to admit that, at the beginning, I couldn't really work out how changing one of the four dimensions wouldn't be a detriment to one of the others. Time has proven me wrong. The best leaders are those who stay connected to their communities, to the people they love, to themselves. In Stew Friedman's Total Leadership, you'll learn simple, powerful new ways to make these connections happen and enjoy the rich rewards that inevitably follow. As the pace of business continues to race forward at lightning speed, Stew Friedman offers us an innovative and sustainable model for successful leadership. Total Leadership provides a unique proposition for individuals who strive to be their very best both personally and professionally. Total Leadership is so aligned with my thinking as an HR executive and medical director of a global business. With practical tools and compelling stories, Friedman demonstrates how to achieve “four-way wins” a distinctive, important new concept for today’s leaders. With a refreshingly simple approach to winning the daily struggle between family bliss and career satisfaction, Stew Friedman outlines clear and innovative solutions for better managing the competing demands of our lives. Engaging and inspiring. In the future, being a leader will require new ways to integrate work with the rest of one’s life, resulting in more effective leadership and a more fulfilling life. Total Leadership points the way. In a world of work-life trade-offs, Stew Friedman offers what most think impossible: a field-tested program that gives you not only what you want in business, but also what you want in life. Brilliant! Stew Friedman’s framework is the most comprehensive and meaningful distillation of how to lead yourself and others that I have encountered. I use the precepts of Total Leadership in my daily life, and I’m better off for it. Total Leadership is an excellent blueprint for optimizing time and energy across multiple domains [and] provides an invaluable methodology for analyzing and realigning priorities to maximize one’s full leadership potential. If you’d like to learn more about bringing Total Leadership to your organization, contact us.